The largest city in Siberia boasts architecture that befits its heritage as a major cultural, scientific and industrial center. As the trans-Siberian train approaches Novosibirsk from the west, the landscape becomes rougher and more arid, marked by small ridges largely devoid of trees. Suddenly, at the very approaches to the city, there appears the broad channel of the Ob, one of the three great Siberian rivers. Beyond rises the skyline of Novosibirsk. With a population of nearly 1.5 million, Novosibirsk has become Siberia's largest and most energetic city, outstripping older settlements such as Tomsk and Tobolsk. 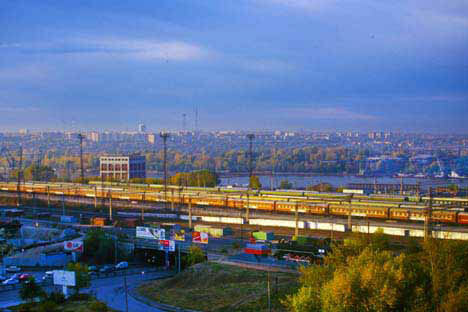 In effect, the intersection of rail with river created Novosibirsk, which began life at the turn of the 20th century as Novonikolaevsk. It is the quintessential railroad town, begun in 1893 as a small settlement called New Village that arose near the site where the great railway bridge for the trans-Siberian was constructed over the wide Ob River. In 1903, the town was formally incorporated as Novonikolaevsk, named after Tsar Nicholas II. The favorable linking of geography and the railroad led to the town's rapid early growth, traces of which are still evident in buildings surviving from the early 20th century. These include elaborately decorated wooden houses of considerable size. For the first two decades of its existence, Novosibirsk consisted almost entirely of log buildings, with only the occasional significant public building of brick, such as the Cathedral of St. Alexander Nevsky (1896-99; now reopened for worship), and the City Trading Center (1910-11), an imposing brick building that resembles a railway station. As in other major Siberian cities, rapid progress in Novonikolaevsk before World War I was brought to a halt by the chaos and destruction of the prolonged Russian Civil War. In the case of Novonikolaevsk, fighting ended relatively quickly with the Soviet recapture of the city in 1919. Its critical importance to the country’s transportation led to a rapid revival, and in 1926 the city was renamed Novosibirsk—“New Siberia.” It soon became one of the major centers of Soviet industrial development, as well as the administrative center for most of Siberia. Indeed, between 1925 and 1937 Novosibirsk served as the capital of the enormous Siberian Region, composed of five pre-revolutionary provinces. This rapid development was reflected in the modern Constructivist design of large administrative buildings that still line the central city's major thoroughfare, Krasny Prospekt. One of the best-preserved examples is the sleek Building of the Siberian Regional Executive Committee, completed in 1932. Later in the 1930s, the city's major buildings reflected the traditionalist leanings of Stalinist architecture epitomized by the gigantic Theater of Opera and Ballet, which has become an important center for classical music in Russia. Construction of this theater lasted from 1931 to 1945, with the final details completed only in 1956. The city's main rail station, completed in 1939 and still ranked as one of the largest in Russia, also displays the grandiosity of Soviet neoclassicism. By current Russian standards Novosibirsk is a prosperous metropolis, with clean, well-kept districts in the central city. New apartment and office towers are rising in the bustling downtown, and a subway system, opened in 1985, now links districts on both banks of the Ob River. The city is home to several major institutions of higher education, including Novosibirsk State Technical University, founded in 1950, and Novosibirsk State University, founded in 1959. Much of the intellectual energy of Novosibirsk comes from the nearby scientific satellite city of Akademgorodok, whose name means "academic town." Begun in 1957 as part of the Sputnik-era scientific boom, Akademgorodok eventually acquired international renown as an idyllic community devoted to the life of the mind. Although slightly disheveled in appearance (like many academics), the town still possesses a quiet charm characterized by parks and streets lined with trees that screen the faceless 1960s buildings. Despite recent funding difficulties, much of Russia's significant research in many disciplines continues to occur in Akademgorodok. In addition to its research institutes, Akademgorodok has a number of museums, such as the Museum of the History of Siberian Culture, with its famous collection of mummies from the high plains of north-central Asia. Akademgorodok also has an open-air museum of wooden architecture. Its display includes archeological items, including prehistoric "idols." But the jewel in its collection is the reassembled log Church of the Savior from the village of Zashiversk, located in the Indigirka River basin some 3,000 kilometers to the east in the Republic of Sakha (Yakutia). Built around 1700, the church served the fort of Zashiversk for many decades until the entire population of the village died from an epidemic of smallpox in 1883. After such a devastating catastrophe, Zashiversk acquired the reputation of a haunted site and was avoided by travelers. Although most of its log buildings gradually fell into ruin, the church—built of rock-solid larch—and its bell tower continued to stand. The rediscovery of this "village of the dead" in the 1930s came as something of a sensation. In 1969-71, the Zashiversk site was carefully studied by a team of experts from the Siberian Division of the Academy of Sciences (based in Novosibirsk/Akademgorodok). In the mid 1970s the church and bell tower were dismantled for shipment to the Akademgorodok architectural museum, where they have now been reassembled. Thus a tragedy in remote Yakutia preserved for posterity this small gem of a church, now on display in the center of Siberia.